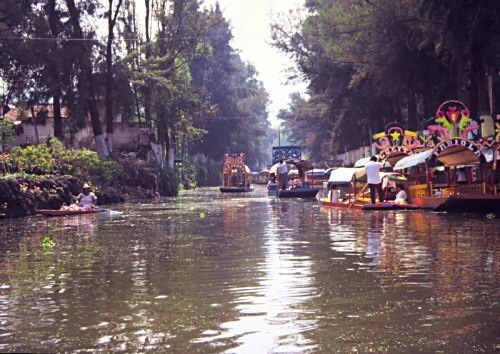 Xochimilco was the agricultural centre of Tenochtitl�n, the great city of the Aztecs. In Xochimilco, you can still see the so-called Chinampas - floating islands made of weeds, and earth on which the Aztecs used to grow their agricultural produce. Actually, this is somewhat similar to the floating islands of the Uros on Lago Titicaca. Nowadays, Xochimilco is a huge tourist attraction: you can take a boat on the canals and enjoy the atmosphere - while vendors on their boats offer you drinks, food and souvenirs. There are even restaurant boats and swimming Mariachi bands! By the way: the name Xochimilco means “flower garden” and indeed you’ll see many flowers and bossoms here.